Fincantieri Yachts in Italy has launched the much-anticipated 140 metre superyacht Victory (hull 6218). 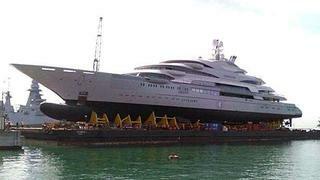 Construction began on the super-sized superyacht back on 1 September, 2010, after the contract was inked in late 2009. Fincantieri has now launched superyacht Victory – which is built to Solas – in Muggiano, Italy. This photo above, by simo_p6 e bebo58, was published in Italian maritime shipping newspaper The Meditelegraph and several social media sites, giving us a first glimpse at this highly private superyacht. Designed by Espen Oeino-designed, the seven-deck superyacht boasts six pools and will carry a 14m tender in a floodable tender garage. Interior design is by Alberto Pinto. Victory will be the biggest addition The Register of Top 200 largest yachts in the world when she is delivered at the end of this year. Superyacht Victory will come in at number nine in the Top 10 largest yachts in the world. Her addition will bump Feadship's 138m Rising Sun off the Top 10.